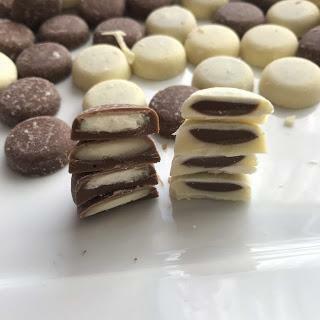 Last week the foodie community got rather excited over the announcement of these new Milkybar Mix Ups chocolates, and understandably so since they're a rare "new" product from the Milkybar brand. 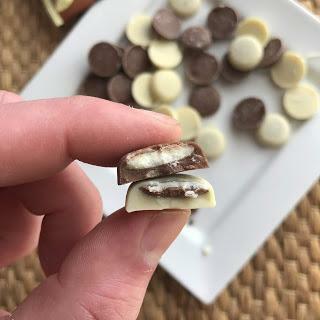 They have done Milkybar Milkshake Mix Up Buttons before of course which were a somewhat similar idea, but the execution of these is much better. 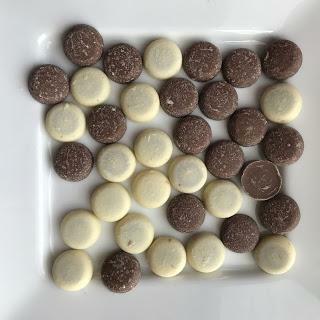 They're a mix of white chocolate pieces with a creamy cocoa filling, and milk chocolate pieces with a milky filling. 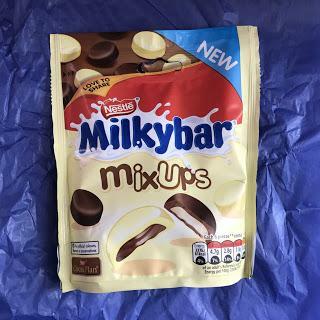 They will be available in all major supermarkets later this week, but I was lucky because Milkybar UK contacted me on Instagram and offered me samples to review. How could I say no?! I started with the white chocolate coated ones first. Immediately I got the distinctive creamy Milkybar taste we all know and love, super sweet and delicious but sickly if you overdo it. The filling has a nice smooth texture, a bit like a truffle and breaks up the sweetness with its cocoa flavour. I loved these ones and found them very moreish! I wasn't sure what to expect from the milk chocolate ones. The chocolate has a distinctive standard Nestle flavour; slightly woody, a bit like the chocolate they use on Rolos, and maybe it's just my imagination but after a eating a few I got a hint of caramel flavour? The milky filling is nice, and I did like these but they weren't a patch on the white chocolate ones and that's mainly because they don't contain actual white chocolate. They're nice combined with the white ones though, and it's quite fun (and confusing) tasting them mixed together.